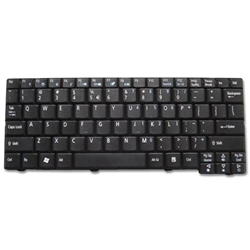 Description: New genuine Acer Aspire One netbook replacement black keyboard. This keyboard may be what you need if your keyboard is missing keys or if it is not working. Part #'s: KB.INT00.513, KBINT00513, MP-08B43U4-698, PK1306F0200, DAFAEZG5R00010, 9J.N9482.01D, AEZG5R00010, PK1306F0900, V091902AS1 UI.